The November 2015 Newsletter has been posted – Links to photo galleries and additional information mentioned in articles in this newsletter can also be found there. Saturday November 14, 2015 the SNU November Luncheon will be held at the Plaza Hotel located at 801 S. Carson Street in Carson City. It is across from the Ormsby House. The luncheon room is on the second floor which is accessed from the hotel lobby. Please RSVP to the SNU at hq@sierranevadaairstreams.org. Due to damage from recent flooding in Death Valley, the SNU rally at Mesquite has been canceled. It is a challenge: winterize the RV or take one last spin. Joe Laing (Marketing Director for El Monte RV,) explains why Why fall is the best season for road trips — “Autumn travel means fewer crowds than summer, better weather than winter, and big savings on vacation costs—if you’re willing to do your homework“. The leaves are turning, the birds are migrating and it’s time for bargain-minded travelers to plan some time away. Bring an extra sweater and plan to play cool weather golf—the discounted greens fees and uncrowded courses will make this your favorite season. Walk a rocky beach and then go back to the lodge for cocoa by the fire. Learn a mountain dance or two at a folk and bluegrass festival. Take a ranger-led hike in search of elk in heart of a national park. Days are getting shorter, campfires more delicious, weather less predictable, and there is a tang in the air. It is invigorating is you are prepared. For the SNU Folks – don’t forget Mesquite Spring in Death Valley at Halloween. A trip down U.S. 395 will likely feature fall colors and perhaps even snow-capped peaks in the Sierra. Maybe also snow covered roads on the passes so keep a close watch on http://nvroads.com/ and perhaps plan your route a day or so in advance with Weather Underground’s road trip planner. Lastly, and one of the single-most useful online tools I’ve discovered in recent years, is the ability to overlay every USGS topo map on top of Google Earth, another free (and extremely powerful) tool to add to your trip planning quiver. While you might be able to take the digital copy down to a local printshop to get a large paper copy, buying the paper copy from the USGS store might get you a better copy at less cost. There’s just something about a big map with lots of detail that isn’t there with the same map viewed on a display. Each has its uses: one is great for virtual exploring with a big table and a good light. The other works for active navigation and map editing. It’s also a lot easier to carry around an extensive map library when it is in the form of digital storage rather than large sheets of paper. Right now, the Appalachian Mountain Club’s Equipped blog has posts on the status of the New England fall color and Railbikes. Looks like a good blog to watch, even if I’m getting back east anytime soon. The October 2015 Newsletter has been posted – Links to photo galleries and additional information mentioned in articles in this newsletter can also be found there. A big campground off US 395 between June Lakes and Mammoth was the substitute locale for the SNU Obsidian Dome get together. 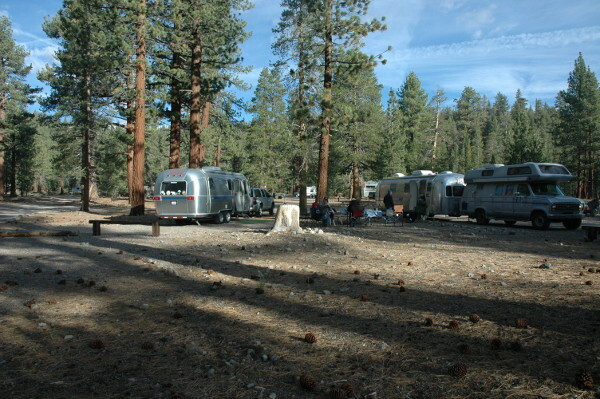 It is interesting that the campground was near full on arrival but thinned out for the weekend. The full timers and the weekend warriors with their toy haulers seem to enjoy this spot. It’s a lot like Hat Creek used to be with a big flat area under the pines adjacent to a creek. This one is getting somewhat civilized as roads and camp areas are being better delineated but many camp spots are large enough for several rigs and there is a lot of open space between them. While the SNU was there, the place was very quiet with little dust and traffic, despite the number of campers.